All of us are good at remembering the connection of food and feeling in the short run. The problem is come when remembering to connect the information to our overall dietary habits and quality of life. It is a curious fact that in the US, one of the most affluent nations in the world, our quantity and quality of life has steadily diminished over the last ten years. We eat a lot of food and a lot of us aren’t feeling so good! Worldwide we are seeing an inverse relationship between affluence and quality of life. As it turns out there is also a direct linkage between what we eat and how we feel. In fact diseases like heart disease, diabetes and cancer (which are on the increase) are directly traceable to the food we eat. The diet of the affluent is sometimes called the Standard American Diet (SAD). Just looking at those graphs makes me pause. 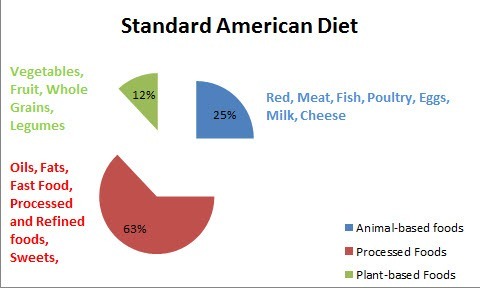 It is a clear picture of how far apart the the Standard American Diet and a whole food plant-based diet really are. It overwhelmingly suggests that few people (even if they are willing) are prepared to make that drastic of a change over night. And probably shouldn’t. Transitioning is important. As you cut animal-based products out of your diet, you add nuts, whole grains, fruits and vegetables. As you cut processed food out of your diet you add more legumes, grains and vegetable. At each step along the way your quality of life improves. Think about a simple process like a slow transition. 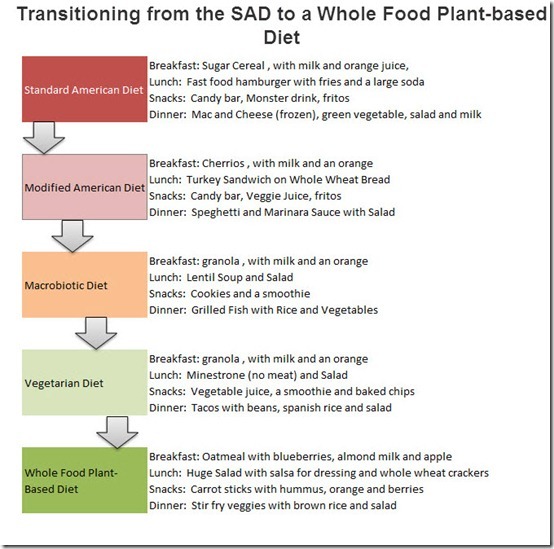 First modify the standard diet by eating less red meat, eating instead, more fish and poultry. Try consuming one less fast food meal a week, or adopting “The Meatless Monday” strategy. It could even be as simple as drinking on 8 oz. glass of fresh vegetable juice each day. The next stage involves giving up all meat except fish and small amounts of “white meats.” Try eating meatless lunches and add a fruit smoothie to your daily juice. There are even a few who get radical and eat vegetarian on weekdays and revert to being omnivores on the weekend. Eventually try adopting a real vegetarian diet. Give up all meats and fish, but still use dairy and eggs while cutting down on the fat in your diet. Finally there is actually adopting a primarily whole food plant-based diet (sometimes called vegan) where you get your nutrition from whole grains, vegetables and plant starches, quit all animal products (meat, dairy and eggs) and cut out most oils and processed foods. It sounds kind of complicated and difficult. But really it isn’t. It takes commitment and dedication. And even with all the dedication it the world it takes time. For example I started my journey as a life-long vegetarian and it took me over a year to actually give up eggs, dairy and most processed foods (I still have a little work to do). David started with a modified American diet and it took him over a year to make the transition. He has more guts than I. 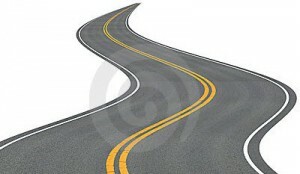 It was a process – often three steps forward and two back. We are still working on cutting down oils and refined foods. The important part is that we keep at it! 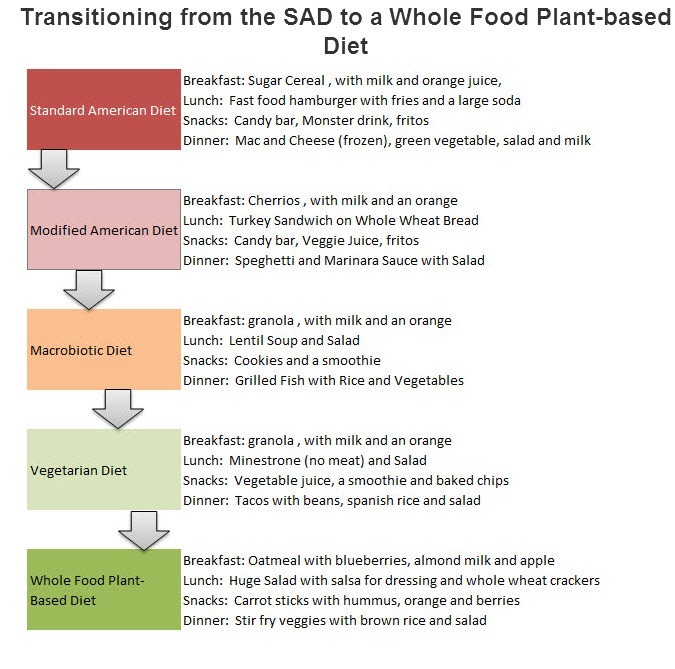 Remember that your choice to more plant-based food is along a continuum. You can move freely along it eating as many or as few plants as you want. Of course, your quality of life (health, well-being and longevity) is on a complimentary continuum where are concurrently choosing your quality of life. It is true, you can choose to be as sick or well as you wish. 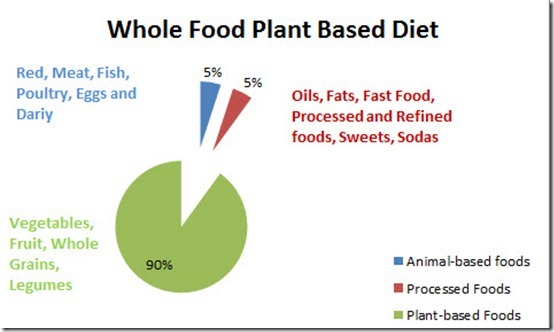 The more plant-based food you eat the better your quality of life. As you tip towards a SAD diet your quality of life decreases. In the most real sense what you choose to eat really, really matters! This entry was posted in diabetes, diary-free food, gluten-free food, John McDougall, plant based diet, T. Colin Campbell, vegan, vegetarian, Whole Food Plant-Based Diet and Chronic Disease, Whole Food Plant-Based nutrition and tagged cancer, diabetes, Health, heart disease, plant-based food, processed food, SAD, Vegetarianism. Bookmark the permalink. 12 Responses to The Journey From the Standard American Diet to a Whole Food Plant-based Diet . . .
Pingback: Atlanta Hotel Midtown » The Journey From the Common American Diet to a Whole Food Plant-based Diet . . .
Pingback: Dating Sites Review » Blog Archive » The Journey From the Regular American Diet to a Whole Food Plant-based Diet . . .